The whole world is looking for a hero, and it's up to a little pigeon named Valiant to step up and bravely serve his country. Valiant (Ewan McGregor) and his fine, feathered friends take to the sky on a wing and a prayer to prove that it's not your wingspan but the size of your spirit that truly counts. Together this rag-tag squadron of birdbrains engages in hilarious aerial adventures at a spitfi… re pace. From the first bumbling day of basic training through the final feather-raising mission, the flock of comical characters swoops their way toward victory. 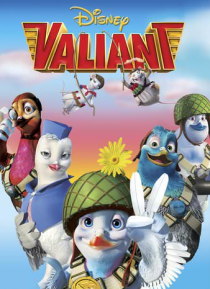 From the producer of SHREK and SHREK 2, VALIANT delivers stunning animation, a top-flight voice cast, and an action-packed story loaded with laughs. It's a soaring family comedy that truly earns its wings.